Alice Steinbach, née Carter, was born in Baltimore, the daughter of a homemaker and a merchant seaman who died in World War II. She graduated from Western High School. According to her son, she was a self-taught journalist who began writing as director of publicity for the Baltimore Museum of Art in the 1970s, producing freelance articles for Art In America magazine and other publications. In 1981, she got a job in the features department of The Baltimore Sun, where she also wrote a weekly bylined column during the late 1980s and early 1990s. She often profiled figures from the worlds of entertainment, literature, politics, society and the arts. 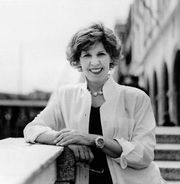 Ms. Steinbach was the first woman at The Sun to win the Pulitzer Prize when she received the award for feature writing in 1985. In her late fifties, she took a sabbatical to spend a few months travelling alone in Europe, and produced a memoir, Without Reservations: The Travels of an Independent Woman (2000). She also was the author of two other books and one of the first regular contributors to the Maryland Morning radio program. She was the 1998-1999 McGraw Professor of Writing at Princeton University. Alice Steinbach is currently considered a "single author." If one or more works are by a distinct, homonymous authors, go ahead and split the author. Alice Steinbach is composed of 1 name.